We’re in the Palm House! Enter at 1000 Washington Avenue. The theme of this year’s conference is rooted in BBG programs that reach beyond the Garden’s gates into the community. Lessons learned from participants in the Greenest Block in Brooklyn contest—celebrating its 25th anniversary this year—will be highlighted. Serving as a centerpiece for the day, a unique keynote address delivered by the garden mentors of the 300 East 25th Street Block Association will honor the power of intergenerational collaboration and neighborly connection. 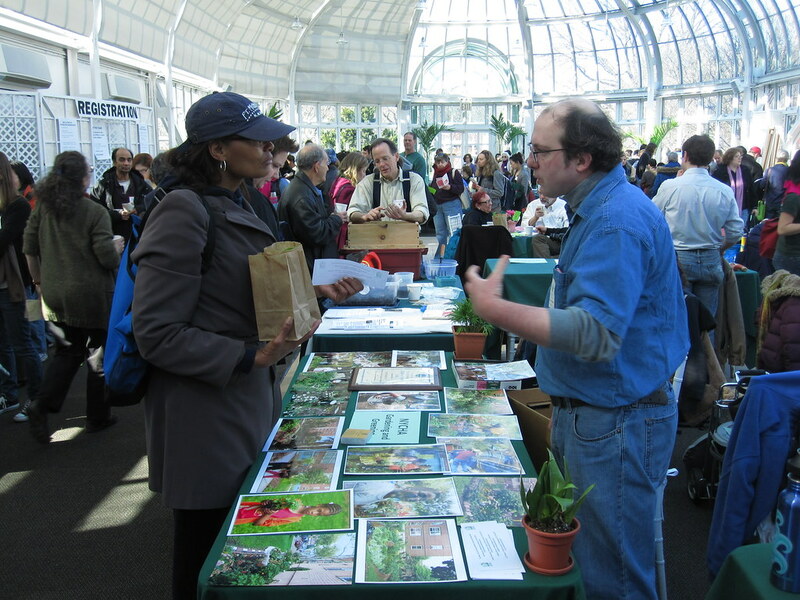 As ever, visitors will have the opportunity to network with dozens of NYC greening organizations in the Palm House. Vanderveer Place, which won the Greenest Block in Brooklyn contest in its first year and three more times since then, is arguably the birthplace of the contest. Its exceptional drought-tolerant sidewalk planters consistently wow the judges. Learn from their hard-earned lessons how to grow vibrant containers and a vibrant community. The deceit and seduction of carnivorous plants dooms many insects and ignites our imaginations. Learn the identification, biology, cultivation, feeding, and conservation needs of these wonderful plants. Prepare a specialized growing medium and pot up your own carnivore to take home. The Tropical House—6,000 square feet under a 65-foot-tall ceiling—re-creates a tropical forest, complete with waterfalls and streams. Discover the many food plants that thrive here! Learn how to raise money through grants or from your neighbors. Whether it’s through a garden party, bake sale, or grant application, you can find the best fundraising strategy for your local community. Project Green Reach (PGR) extends the Garden to Brooklyn’s K–8 Title I schools by providing inquiry-based science instruction, plants, guided tours of BBG, teacher training, and supplies for a community horticulture project. Its Junior Botanist and Plant Investigator summer program also engages rising 5th through 8th graders in gardening, cooking, science, and nature at BBG. Learn more about the long-lasting impacts of this amazing program, now celebrating its 30th season! The International Rescue Committee’s New Roots Community Farm supports refugee resettlement in the Bronx by sharing skills and building community through food. New Roots gardeners will share personal recipes and cooking techniques from their home countries as well as tips for saving seeds and growing delicious vegetables right here in the city. There’s no better way to spread the love of gardening with your neighbors than making free plants. Explore propagating with runners, bulbs, rhizomes, leaf and stem cuttings, offsets, and adventitious buds. Turn common grocery store items into garden glory. You’ll take home your own plants to multiply! Art and gardens can serve as powerful catalysts to fight profit-driven destabilization of our communities. Inspired by ARTs East New York, come unpack a tool kit for cultivating a resident-led vision of the future. Keeping the seeds and seed stories of our ancestors is essential to preserving our past and safeguarding our future freedom. Explore the rich stories of heirloom seed crops, and dig into the science and practice of collecting and storing seed using common kitchen items. Compost happens—even in your tiny apartment! Learn how to harness the power of red worms to convert your kitchen scraps into black gold, no matter where you live. Get an overview of how to bring about meaningful community change. Learn how to address your neighborhood’s most pressing needs and target specific solutions. Gain tools you can use to craft a mission statement, strategize your action plan, recruit volunteers, and build alliances. BBG’s groundbreaking Water Conservation Project, the first of its kind in North America, is really making a splash. Learn how this innovative water recirculation system serves as a beautiful model for reducing dependence on freshwater and lessening combined sewer overflow. Weather permitting. Native plants are essential to the health of our local ecosystem, and cities can play a central role in their conservation and restoration. Get great garden design advice from the GCC’s native plant nurserywoman on planning, sourcing, and planting colorful, pollinator-friendly plant palettes, whether you’re digging into a community garden, yard, street tree bed, or container. Snacks and boxed lunches are available for purchase at the Yellow Magnolia Coffee Bar in the Visitor Center. Look for signage in classrooms and the Palm House for areas to sit, eat your lunch, and chat with fellow attendees. Palm House: View exhibits presented by New York City greening organizations. Conservatory: Join a guided walking tour of BBG’s seasonal highlights (1–2 p.m.). Rotunda: Pick up free seeds. Rotunda: Bring your questions to the “Ask the Gardener” table. Rotunda: Meet bugs and slugs at the American Museum of Natural History table. Rotunda: Learn about BBG’s Children’s Education programs. Rotunda: Check out the Library. Questions? Contact [email protected] or call 718-623-7250. Accommodation can be made for visitors in wheelchairs or with limited mobility. If you need additional accessibility accommodation, please contact us at [email protected] by February 21. Brooklyn Botanic Garden gratefully acknowledges support for these programs from Brooklyn Community Foundation, National Grid, NYS Office of Parks, Recreation and Historic Preservation, the NYS Assembly and NYS Senate, NYC Department of Cultural Affairs, the NYC Department of Sanitation, Brooklyn Borough President Eric L. Adams, Councilmembers Laurie Cumbo, Mathieu Eugene, and Alicka Ampry-Samuel, and the NYC Council. Making Brooklyn Bloom 2011. Photo by Rebecca Bullene.